Earn $2.49 in Rewards credit. Click to learn more. The best of both worlds. The K847 Kross Plus features a slick center tread for a speedy roll on the pavement, plus pronounced side knobs for cornering control off-road. The K847 Kross Plus is available in 26 x 1.95 Inch (50-559 ISO). 65 psi max. Wire bead. 620g. I am impressed and very pleased. It rides smooth on pavement and well on dirt. It takes considerably less effort to pedal compared to the flat surface road tires I had. These tires are easy to install and provide a great ride on paved surfaces but, they can hold their own on the trail as well. The paved roads of the Chickamauga Battlefield lead to more aggressive and demanding dirt trails that undulate along the Chickamauga creek. The Kenda Kross Plus tires provide a stable comfortable ride leaving the rider confident and aware of their capability on either surface. This tire is a great compromise from a full knobby, it is a smooth ride yet you have the bite in turns ,,highly recommend. Bought these tires because I had a similar designed tire as a kid back in 1984 and loved them. Yes, I bought the first 26er MTB ever made, actually they where just taking off then and perfect for the conditions of the area of eastern Washington, allot of us hunt off bicycles.If your looking for a tire that has less drag than traditional MTB tires but still need to handle the ruff stuff these are it! They work well in hard pack trails,logging roads and in dry silty conditions, even a little mud they still fit the bill. On pavement,well, ya think your riding a road bike and the price is less than buying some cheap tire from Wally world. These tires are great. Good looking, fast, and tough. Rode them around in rough alleys and glass strewn parking lots on purpose to proof Test them. They pass with flying colors. The one minor complaint? They are a bit harsh riding. But given the toughness of them, it's well worth the tradeoff. Highly recommended. Ok for the street, not so much for off road. Three flats on new tires when biking the C & O and GAP. One thorn like puncture, one sharp shark tooth like stone and one unknown leak, (solved after replacing the tube.) After the third, I started picking the stones out of the 'rain groove' around every 20 miles or so, and haven't had a flat since-finishing the trails and then riding acouple hundred more miles on pavement. You draw your own conclusion. Three stars for the price and they seem to be fine on pavement around my area. (Do rain grooves really work below 20mpg and I really didn't need the knobs for my riding. It's a fast tire for pavement and light dirt duty. Turned my old mountain bike into a quick commuter. The thin wall tends to allow cuts into the tire. I've had one cut by glass and a 2nd one cut by metal wires on the street. I rarely ride off-road. I wanted tires that gripped well in sandy roads, hard packed dirt, not so well maintained roads and occasional use on dirt roads. I wanted less rolling resistance without sacrificing grip. These tires met that challenge. I have increased my normal ride speed on my mountain bike from 11 to 14 mph average. I have only had them a short time so I can't talk about wear or flat tires. I can't say the tire is awesome, but it works well for us and I would recommend them. Most of our riding is on the road hard pack and we haven't had a problem with flats. To me, the sidewall looks thin, so I don't know how well they'd hold up on sharp gravel or rough terrain. Great tire for the price,would recommend to anyone riding multiple surfaces. I ride the Great Allegheny Passage the trail and it is a mix of pavement crushed limestone and dirt. The tire performed well on all three surfaces. I run it with 50psi so when I transition from each surface I have good contact. I inflated the tire to 40psi and the tire fells flat at 60 psi you might as well run with slicks. You will find 50psi will this will slow you down a little. I'm not racing just out to get some exercise and enjoy the views along the rivers. these tires are very functional dispite what people may think about the agressive tread on the sides. these tires really made mine and my dads mountain bike have the best of both worlds. we wanted the rugged durability and suspension of a mountain bike, but since we ride on the road a lot too, the constant resistance of fully agressive tread mountain bike was tough. not to mention they wear down faster. these tires are the best combo of fully slick and agressive tread. i think they are much better then tires that are fully slick or fully studded but still try to do both. i think these tires can help people get the most out of there bike. I ride in the city, on pavement and sidewalks, smooth tire. A must have if you ride your Mountain bike on paved surfaces. I ride 11 miles a day for exercise on paved bike trails. With knobby tires I averaged 15mph and with the K847's I am easily 16 mph. Much faster to accelerate if you slow down to get around someone. The coast time is improved considerably! I am 240 pounds and they hold me fine! 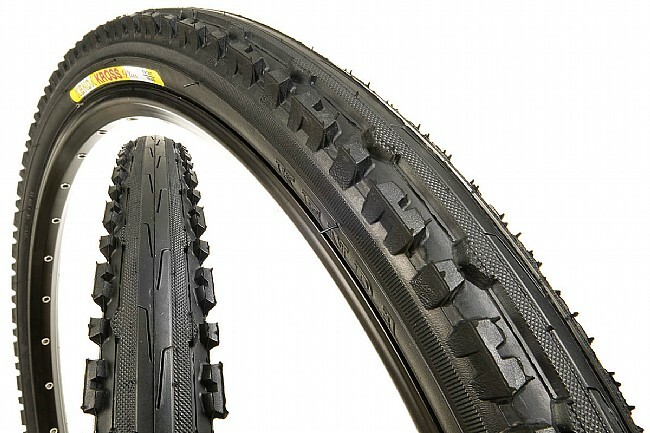 I love the Kenda Kross tires. They ride like street tires on asphalt and concrete, and have the grip of cyclocross tires on rough terrain. They cut my drag and times significantly over other hybrid tires I have tried. Tires got here the next day!!!! What the.....? Thanks a bunch.Have them on other bikes, they work great! Great commuter tire as thick center rib rolls smooth and provides extra puncture resistance. I now have them on 5 of my bikes,and yes, I know I have a bike problem. I don't ride on dirt much, but a local gravel short cut proved these tires worthy of that surface as well. to sum up........great urban commutercruiser tire for the price. AND they got here next day with standard UPS delivery. I like these tires for trail and pavement. Same as original on my hybrid Raleigh! This tire is awesome for rough road commuting - fast and tough! Great tire for commuting. Fast and durable. First set lasted several thousand miles. Flats are rare as the main tread section is thick.